What’s love got to do with it? Everything, EVERYTHING! Well… maybe not everything but the closest thing I can think of to everything then! Now let us get it straight and clear out our definitions about love, not that love can ever truly be defined. Love like all magical things, has a tendency of escaping the narrow confines of every definition. It just simply eludes you as soon as you think you got it all figured out. Having said that, we can let those two remarks be our initial definitions, namely that love is indefinable and love is magical. Especially on Valentines day when our whole society goes around buzzing about the idea and the marketability of love, I mean, it is at this time of year that it becomes the biggest trend for a day or two amongst the masses, the companies and advertisements and then fades off. Candies, chocolate and cakes are made in the shape of hearts, all the while maybe the real thing maybe doesn’t truly reveal itself. In this blogpost, we will want to become wiser on the topic of love, and that is precisely what we will accomplish! And if you don’t know what this website is about, I could tell you concisely that the sites only focus and quest is to share words and experiences that help you to become attuned and in harmony with your own direct experience. The empowerment and primacy of direct experience is therefore the mission and you are its receiver and participant. Now, you might ask what exactly is direct experience? Well, my reply is… Don’t worry about that one, just follow the love and all will be all right in the end. Having said that, love happens to be one of the greatest paths of reaching this gate of direct insight, therefore below I shall list 15 selected quotes on love which I’ve found to be thoroughly endearing, empowering and spiritually enlightening throughout the years. Follow the breadcrumbs of love! Too often is love a shackle and not a open vista between people. Khalil observed the very same thing many moderns are noticing today. Many couples nowadays, and for all I know, through history as well, have made their relationships into rigid shackles that binds them for good or for worse instead of functioning as a liberation of their souls expressions. These binding shackles which are in turn enforced by the prevalent cultural norms and conditionings. Now… this is not how love blooms into its maturity, this keeps it locked and repressed in the psyche of man, and this is not the path to direct experience. Love is the great antidote to all of the miseries that life throws on you, this has ever been so and always will be so. As Sophocles pondered 2500 years ago, so a wise man thinketh today. Somehow love makes all worth it, even though you may be going through your darkest hours. Love is the light which only a glimpse can make you forget all the darkness. Love is our remedy and we are very lucky creatures to be able to experience it. Truly these words are probably one of the most beautiful and potent words one has said about anything on this blue-green ball floating around space. Namely that its not merely about your senses, not merely about your mind, but your heart is the real goldmine, it is there where the real insight lies and it is through the heart that one arrives at the gates of wisdom. her petals fell to the dust. Earthly love sometimes come to an end, sometimes bitterly and sometimes less so. This quote is in truth quite open to interpretation as it doesn’t have to be about love. However its beauty, elegance and simplicity has touched me throughout the years and I’ve always thought about the love between two people that has come to an end when I read it. The memories that are dispersed in ones own mind about how it was and inevitably how it could have been if one still was together. Maybe this is only my own feeling about those wonderful words by Tagore, what are yours? For the union to materialize. Separation brings promise of union, no matter how distant or abstract that union may seem to be. 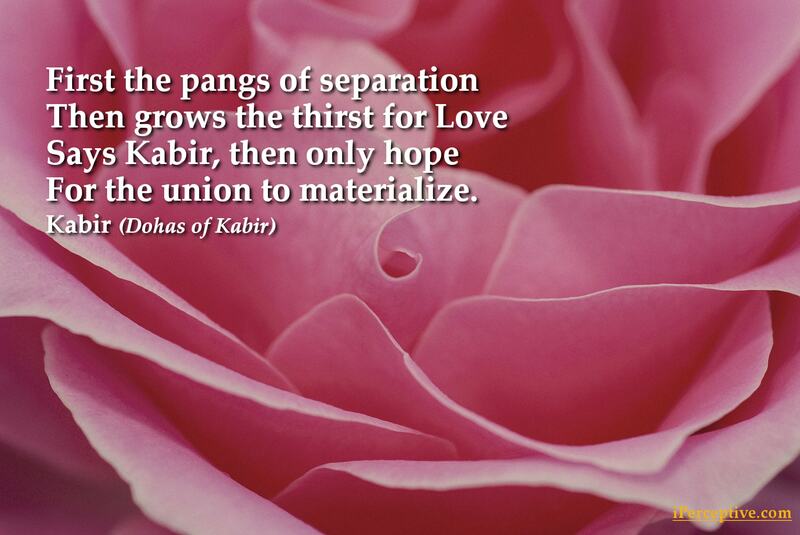 Kabir in this Doha, eloquently expresses both earthly loves and the love of an mystic. Now if you don’t know about the love of an mystic, then thats why I’m here for! Love is as we touched on, indefinable. Its expressions are great and vast, beyond our mind and intellects comprehension of it. The love of a mystic is in my own opinion, the most universal, pure and unconditional love there is. The mystic finds her own beloved in the confines of her own soul. She realizes that shes not merely an body and a mind walking around trying to figure out life. No, no… The mystic becomes a silent witness to her own timeless beauty, and falls completely and utterly in love with it! A love that is not like Narcissus, mind you! But something entirely different and something unfathomably sublime. There, there If I went to far, its okay, we’ll get back to the love of a mystic soon enough. If you thought earthly love was indefinable, oh boy, where should one even begin when it comes to the love of a mystic. Be a rainbow in someone else’s cloud. Sometimes we just need to be there for others and shine our own true colours for their inspiration. One simple act of kindness can illumine the entire world of an individual who has been down on his luck. The late and great Maya Angelou put it simply and beautifully. So be true to thyself and shine! When you love, you become infinity. When your love simply radiates out of your being without any intention or aspiration, this love empowers you in all dimensions. One becomes godly when love is expressed like this through oneself. Why? Well because when one thinks about it, only some kind of a Supreme Being can have that grace and power to do so… and you apparently! Love is a gift, and we should consider ourselves lucky to be able to feel, share and be it. This is one of the most intimate forms of love there is, Rumi is expressing precisely the love I mentioned when going over the quote by Kabir. It is the sublime love that arrives when one seeks union with the beloved, and the beloved or the friend is simply the Sufi’s term for God or their idea of the Supreme Being. It is in this love, one becomes timeless, weightless and without boundaries, as you become love itself, infinite and unfathomable. Love does not dominate, it cultivates. And that is more. Love makes you and everything around you grow. If you talk to a plant and say words infused with love, that plant will revere you and inevitably love you back. Though you may not sense it through your senses, your heart will know it if your mind and sensitivity is open enough. Now if you do the opposite and say hurtful words to that very same plant, it will sure enough wither away. Everything has an energy, and love has the beautiful quality of cultivating the energies that makes us grow into maturity and strength. Love always creates, it never destroys. In this lie’s man’s only promise. These words from the love doctor is quite similar to Goethe’s words above, except with the addition of the idea that the creativity of love is man’s only promise. Or maybe put a bit differently, love builds bridges that unites that which has been separated. In this world so characterized by separation and alienation, love is the only cure and man’s only promise. Hatred paralyses life; love releases it. Hatred darkens life; love illuminates it. Martin Luther King in A Testament of Hope: The Essential Writings and Speeches of Martin Luther King, Jr.
Love is the cure for all the misfortune that hatred and delusion brings to the table. As said above, we need bridges and harmony between groups and the peoples of the earth. Martin Luther King Jr. knew this very well, and he preached it to the very end. God bless! We are People who need to love, because Love is the soul’s life, Love is simply creation’s greatest joy. Hafez like Rumi and Kabir most often used love to express their longing for the divine. In their own hearts this love unequivocally transcended all other loves. This love was the pinnacle of the human enterprise, for it was this love that brought one to ones own source and creation. It was this love that truly allowed a total dissolution into the One. It is this love that is the meaning of life. To know it, to feel it, to see it and lastly to be it. The universe is a big place, and sometimes in comparison to it we can feel quite small. When considering the images we have received from the Hubble and other telescopes, we are confronted by the sheer immensity of it all, but also the beauty. The universe is a big beautiful place when seen from the right lenses. Carl Sagan shared his thoughts on a powerful existential situation, and his conclusion was that love was the only refuge in the end, and I agree with him wholeheartedly! So love, love until the night collapses! A loving heart is the greatest wisdom and Tolstoy knew this very well. He wasn’t so caught up with superficialities or intellectual shenanigans, but he was fascinated by the understanding derived from living and loving. In the end as Antoine said above, the essential things are seen with the heart. Truly this was the case for Tolstoy! There is always something left to love. Never does the ocean of love run dry, there is always something you can shed your light upon. Whether it is a friend, a stranger, a parent or your loving partner in crime. You are never at a lack when it comes to loving, though I know it may feel so at times. Especially when one watches the news or if one randomly winds up somewhere in the dark corners of the internet. Never forget there are always beautiful people, creatures, plants, things that await your love, in which they could be nourished and benefited from. So empower yourself and your surroundings! Hopefully you were inspired by these wonderful words on the topic of love! That being said, if you long for more quotes on love (mystical love) here’s another collection we’ve got on iPerceptive, namely spiritual love, or you could always read the works of the sufi mystics, that will always satisfy your need for love poetry.